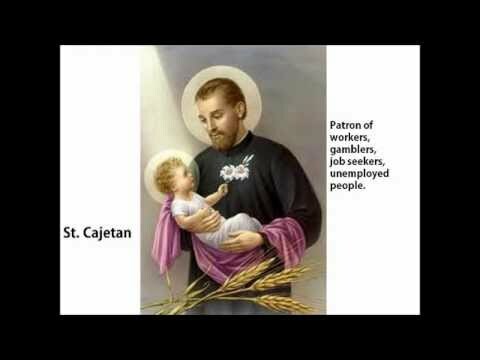 workers; gamblers; job seekers; unemployed people Founder of the Theatines, born October, 1480 at Vicenza in Venetian territory; died at Naples in 1547. Under the care of a pious mother he passed a studious and exemplary youth, and took his degree as doctor utriusque juris at Padua in his twenty-fourth year. In 1506 he became at Rome a prothonotary Apostolic in the court of Julius II, and took an important share in reconciling the Republic of Venice with that pontiff. On the death of Julius in 1523 he withdrew from the court, and is credited with founding, shortly after, an association of pious priests and prelates called the Oratory of Divine Love, which spread to other Italian towns. Though remarkable for his intense love of God, he did not advance to the priesthood till 1516. Recalled to Vicenza in the following year by the death of his mother, he founded there a hospital for incurables, thus giving proof of the active charity that filled his whole life. But his zeal was more deeply moved by the spiritual diseases that, in those days of political disorder, infected the clergy of all ranks, and, like St. Augustine in earlier times, he strove to reform them by instituting a body of regular clergy, who should combine the spirit of monasticism with the exercises of the active ministry. Returning to Rome in 1523 he laid the foundations of his new congregation, which was canonically erected by Clement VII in 1524. One of his four companions was Giovanni Pietro Caraffa, Bishop of Chieti (in Latin Theate), afterwards Paul IV, who was elected first superior, and from whose title arose the name Theatines. The order grew but slowly. During the sack of Rome in 1527 the Theatines, then twelve in number, escaped to Venice after enduring many outrages from the heretic invaders. There Cajetan met St. Hieronymus Æmiliani (see SOMASCHI), whom he assisted in the establishment of his Congregation of Clerks Regular. In 1533 Cajetan founded a house in Naples, where he was able to check the advances of Lutheranism. In 1540 he was again at Venice, whence he extended his work to Verona and Vicenza. He passed the last four years of his life, a sort of seraphic existence, at Naples where he died finally of grief at the discords of the city, suffering in his last moments a kind of mystical crucifixion. He was beatified by Urban VIII in 1629, and canonized by Clement X in 1671. His feast is kept on the 7th of August.